It has been a really long time I posted anything here on the blog, something that I was extremely passionate about. I've been extremely busy working day in and out for my Bachelors in Education course, so didn't get the time to blog. But, recently a great number of shocking events happened in my city (or for that matter the entire nation) which made me pull my socks and I decided I just had to write something abut it. I don't know what difference it makes but I needed the few readers I have to know what is happening and come out and join us in the protest if they believe in the cause. A bunch of hostel students from the prestigious Jadavpur University in Kolkata dragged a girl to the hostel premises and assaulted and molested her on the grounds of indulging in indecent behavior. Her male friend was not spared either and was beaten up too. This happened somewhere around the end of August. No action was taken when the girl reported the matter to the Vice Chancellor of the university or for that matter when she could identify one of the criminals and registered an FIR at a nearby Police station. The students of the university decided that they had to do something to make the authorities recognize the wrong done and bring justice to the girl. The students had 'gherao-ed' (surrounded) the faculty building and were sitting outside with slogans and peacefully protesting. The VC, instead of doing what is right, was supposedly so scared for his life that he decided to call the police in the middle of the night, who blindly brutally lathi (batons) charged the innocent and unarmed students and molested, groped and assaulted the female protestors. 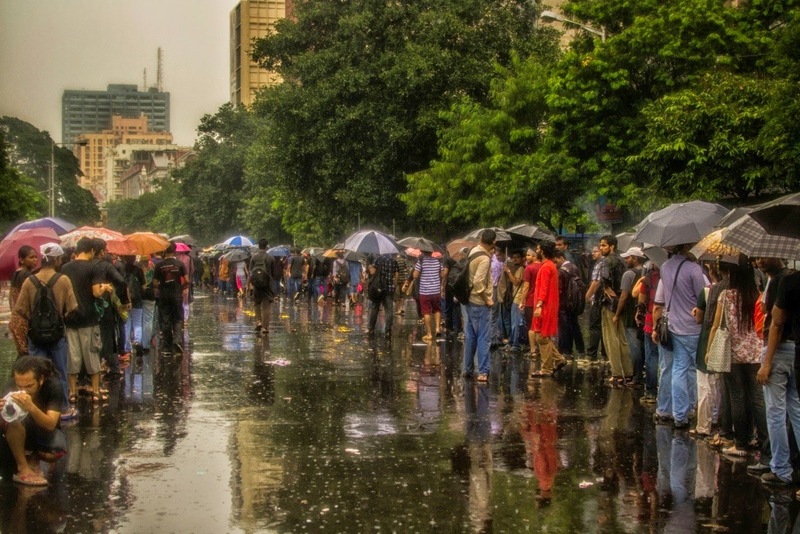 In protest to this heinous act, more than 1,00,000 people came out into the streets in Kolkata, braving the torrential rain, leaving behind every other important work to voice their concern and disgust in the form of a peaceful rally and to meet the Governor. The entire incident got National and International coverage. See it here, here and here . Our protest demands justice for the girl and for those innocent students who were beaten into pulp. It is disgusting how irresponsible, monstrous and inhuman our so-called teachers have become. As a would-be teacher I'm ashamed and disgusted. 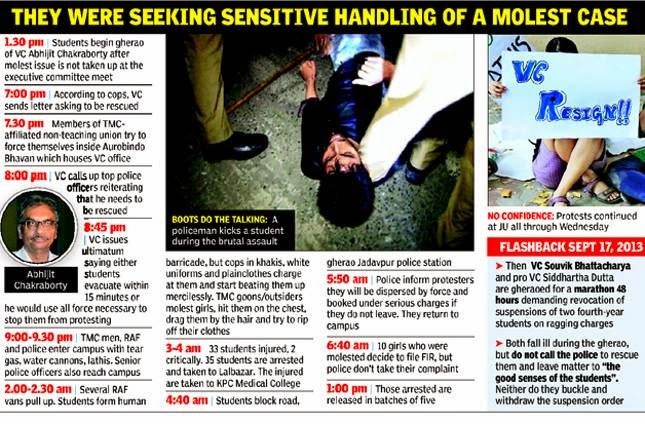 It is appalling how educational institutions which are supposed to provide quality education to the young generation and provide a peaceful and safe haven to them for the same have turned itno battle fields where students are assaulted, molested and cruelly beaten up by those who hold power. Here are a few reactions from people I know which will give you two different perspectives of the issue.
" I have been a student of Jadavpur University for the last five years, and to me it has always been a home away from home. My safety and my dignity having always been assured in this campus, I realized on 28th August,2014 and 19th September, 2014 that there are times when one’s home can also be intruded into. Standing beside my classmates, my friends, my juniors and my college mates who got beaten up by the same organizations that have promised us respect and safety for civilians, women and students, I understand that in Bengal and in India, all these promises are always smothered by these same people. A girl has been molested, in her own university, and yet the first questions raised are against her dignity, her integrity. Some even come to think of the entire situation being something she deserved. In such a land, there can never be any form of justice. 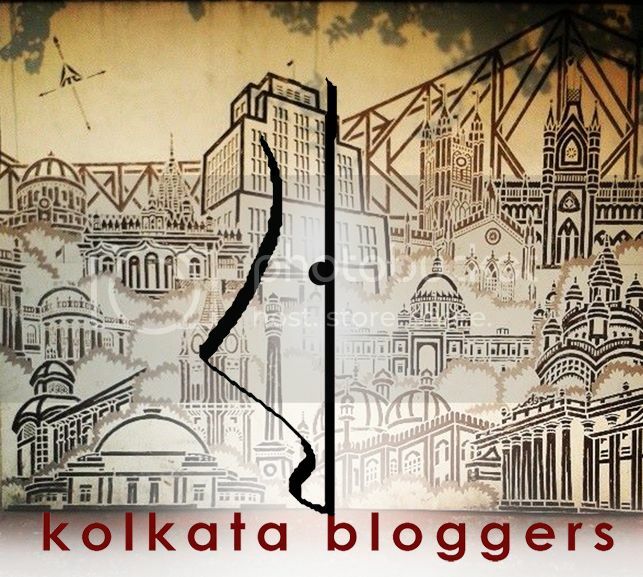 We, as the students of Jadavpur University have always come across people, who being insecure of themselves, will always speak rot about the students. But when my friends were beaten up, my juniors were groped, and my classmates were physically thrown off, I sincerely doubt these people who call themselves ‘People’. 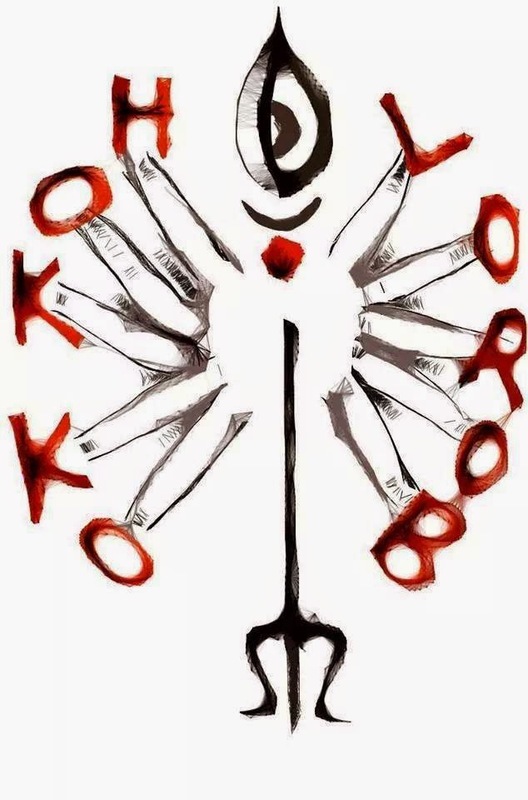 It is not a call to arms, neither is it a signal for chaos, all this movement is about is that one girl who deserves justice be allowed that space wherein she can claim her demand. I, as a student had kept faith in our Vice-Chancellor, Mr. Abhijeet Chakraborthy regarding the situation, and I along with all of my fellow students have been brutally let down. All this movement is about is to remove that person who had promised us our safety, because we have realized that unless there is no assurance of protection in our very own university, we cannot trust our ‘elders’ with ourselves. We have always sung our songs in the face of blows, and we continue to do that. " 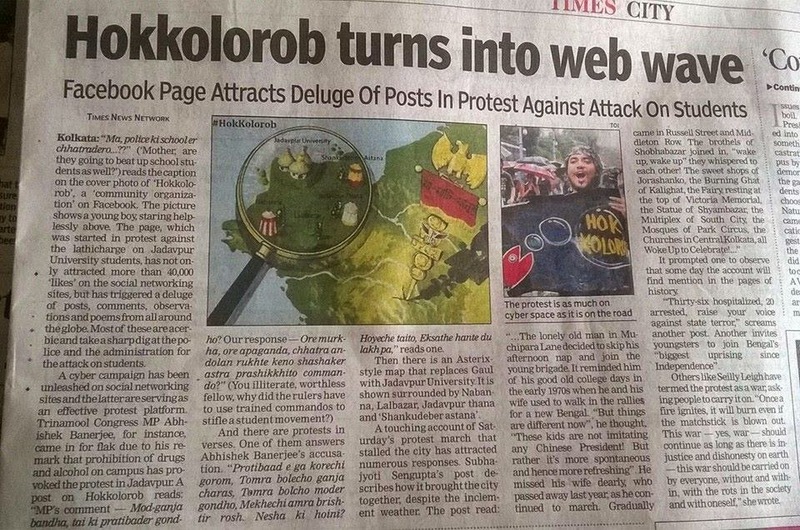 "Welcome to the Fascist West Bengal where the fundamental right of freedom of speech and expression is curbed. So you are EDUCATED? a FREE-THINKER? an INTELLECTUAL? Can express an UNDAUNTED FRAME OF MIND SANS any BIAS? Don't worry, you'll be labelled either a MAOIST or a NAXALITE. Or how about being rendered the exclusive treatment of brutalization, molestation and then imprisonment? 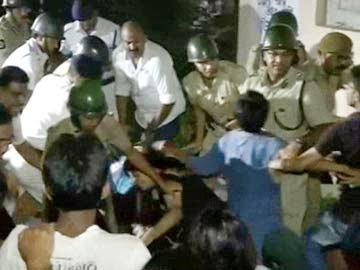 The students of Jadavpur University protested against the molestation of a girl at the institution. The output? They get brutalized mercilessly and are dragged behind the bars. AN ISSUE AS SIMPLE and NOBLE as this. Where on earth are the topics of alcohol consumption and weed emerging on the scenario? And the procession of the COUNTER "protest" today led by the ruling power... What was it for? MORALITY is DEAD for THESE PEOPLE and so are their humanitarian attributes. Thanks goodness, T.S. Eliot that you're dead...because after witnessing this even you would have fallen short of words! It is Mohaloya today, Maa Durga has left her heavenly abode and come over to visit us earthlings. The ten days following are a celebration of the struggle and the victory of the good, the righteous and the brave over what is wrong, corrupt and evil. There is no better time to stand up and raise your voice against the wrong you see around you. No voice is small. Shout out loud and make it heard. Read Aniesha's take on the issue here. Shubho Mohaloya , everyone !! Rightly said, Haddock! This was not really a political event initially but it did turn into one with the involvement of the ruling party. Indeed, Monica. I cannot agree more to what you said. Every time you think things couldn't turn any worse, something else happens which shatters your faith in humanity. Birthday Wishes for a Flawless Friend!